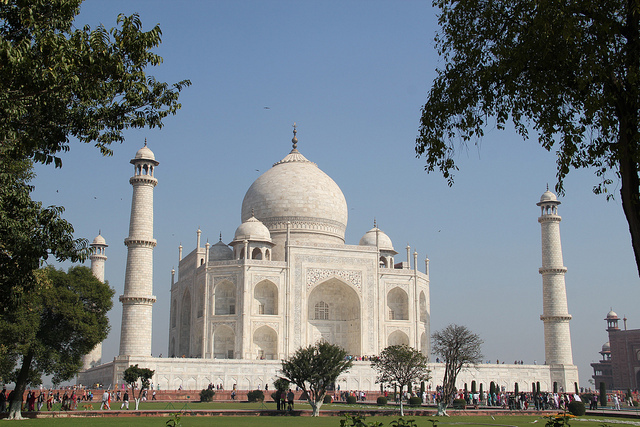 Almost each Indian family has a Taj mahal in their list to visit and why shouldn’t it be? It is the on the top list of every foreign tourists while their stay in India. The great Taj Mahal, breathtakingly amazing white marbled sculpture which is in one of the seven wonders of World is an impeccable example of symmetrical structure; especially enchanting since it was built five centuries back. Mughal emperor Shah Jahan dedicated this taj mahal to his third wife Mumtaz Mahal who died while giving birth to his fourteenth offspring. It took 20 years to complete this sculpture and more than 22,000 people to build it. Taj mahal is considered as a “symbol of love”. It is a wonder when we watch this monument carefully that this could be built in 16th century meaning how developed and skilled architectural concepts existed at that time. The calligraphy written on the great gate says “o soul though at rest return to the lord at peace with him & he at peace with you”. It is said that Shah Jahan wanted to build the same building but in black marble on the other side of the river but that couldn’t be fulfilled since he had a war with his sons for the crown of the emperor ship. Taj mahal is in the Agra district of the state Uttar Pradesh in north India. It is 124km away from the Delhi, the capital city of India. After reaching Delhi one can hire car or go by bus to Agra. The name taj mahal means the crown palace. It is among the list of the seven most notable places all over the world. Taj Mahal takes different colours at different times of the day. It is assumes that symbolizes the moods of his queen Mumtaz Mahal. It is pink in the morning time; it looks white in the day time and golden in the moon light. It was rumoured that many precious stones were hidden in the walls of this monument while the time of construction and they could be seen in the moon light on full moon night but those were snatched and taken out by British during 1857. It is considered to be a romantic place; may be because of the history it has left behind but when you visit this place with your loved one and feels the beauty of this place during the night you can’t stop falling in love once again with your loved one, yourself and with this beautiful place.